Two weeks ago my husband told me that he ate at Pepper Lunch and sobrang sarap and lambot daw ng steak and he promised me that we will eat there. He knew that I love steak. 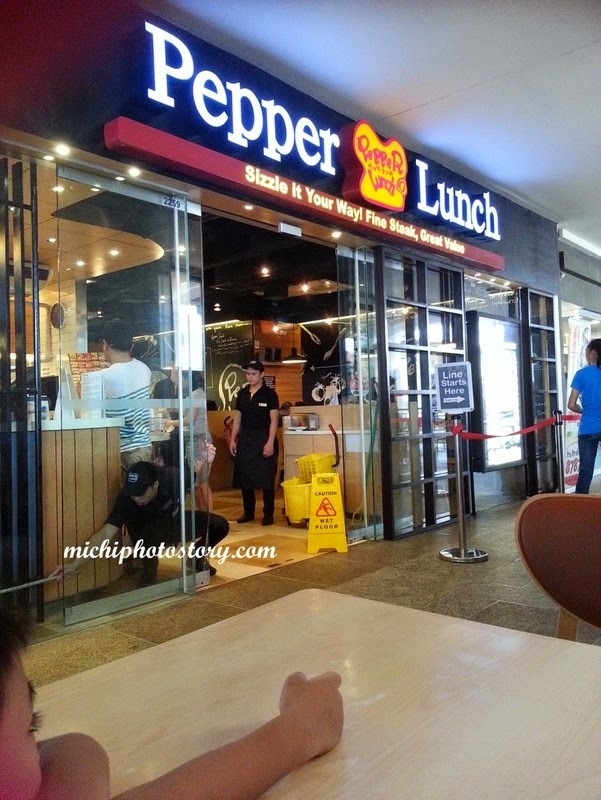 Last October 5, day after our field trip in Subic we went to Alabang Town Center to eat at Pepper Lunch. I always see this every time we eat at Yabu and Vanilla Cupcake Bakery but wasn’t interested to try it. Upon seated, the staff gave us the menu but you have to go to the counter to order and pay for your meal. 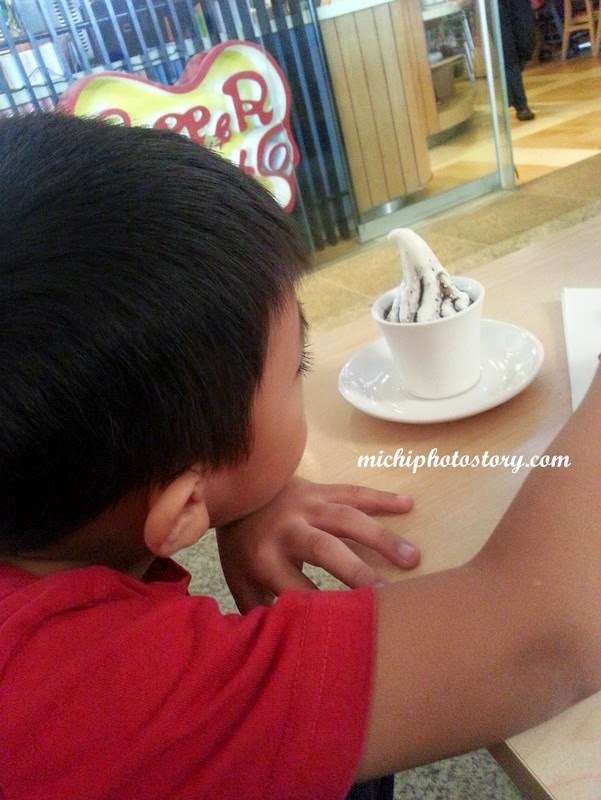 Since it was my first time, I let my husband chose my meal and my son only ordered dessert which is Goma Soft P55. 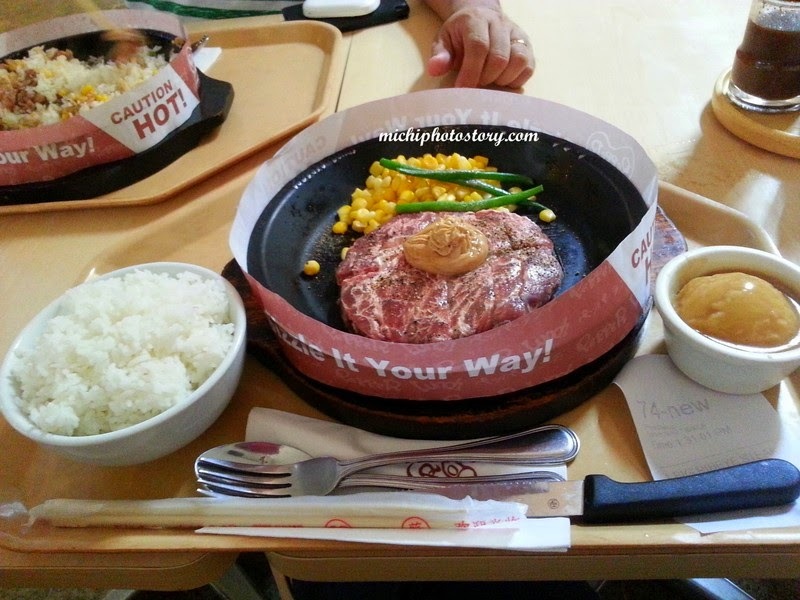 Pepper Lunch is a DIY Teppan restaurant originated in Japan that gives you fresh culinary experience because you have to cook your own food. I did not know that I will cook my own steak, my husband told me na manood ko ng TV kasi ako daw magluluto. But it was too late because our ordered came already. I was so amazed so I took picture and video and my husband reminded me na lutuin ko na kaya food ko, mawawala na yung init. Hahaha! The food is assembled in the Iron plate which was uniquely designed and patented in Japan. In 70 seconds the iron plate will heat up to 260C and remain hot for more than 20 minutes at 80C. 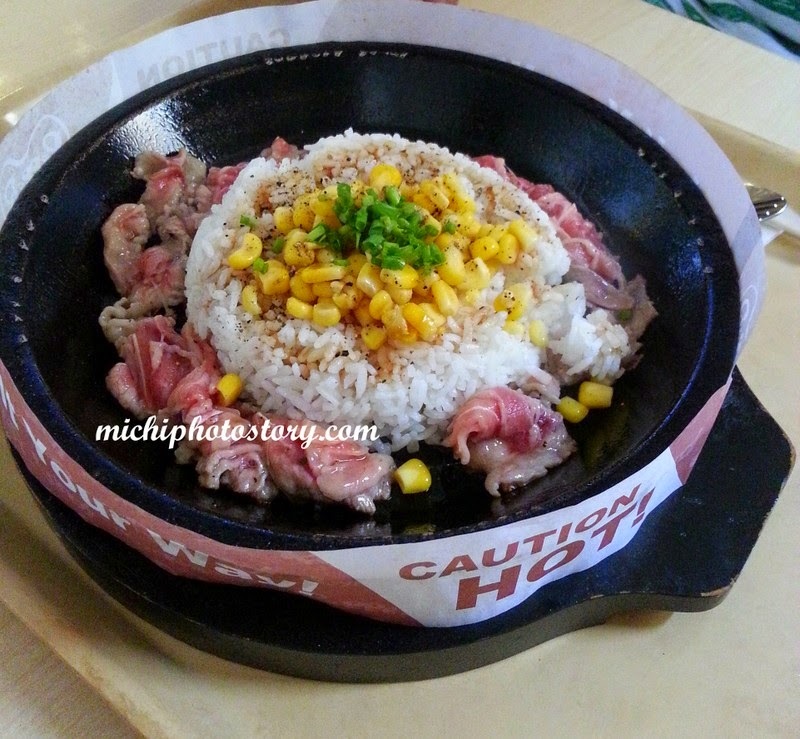 My husband ordered Beef Pepper Rice P198 and Big Ribeye Steak P635. My steak includes corn, long beans, rice and mashed potato. I was so happy with my steak, it was tender, juicy and true enough ito na pinakamalambot na steak na natikman ko. It almost melts in your mouth, ganito ba pag premium steak? It was worth the splurge, I shared my food with my son but he only likes rice and corn so I finished the steak and mashed potato all by myself. Next time I will add more salt and pepper since I’m not fond of putting sauces in my steak. 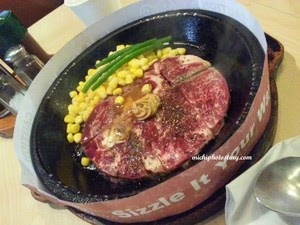 I love the idea of “Sizzling it your way” because I can cook my own food according to my preference. And because I loved the experience and I enjoyed my food, I know that this is not my last time eating at Pepper Lunch. The staff failed to ask if it was our first time or siguro kasi matagal na yung Pepper Lunch so feeling niya alam na namin. Lol So if ever you will dine in Pepper Lunch don’t forget to watch the video while waiting for your order. We went back again and I noticed the limited butter on top compared to our last visit. Cooking it yourself makes the whole thing exciting. It is a good deviation from the conventional fast food. I love eating at Pepper Lunch. Sauce pa lang, ulam na. Hehe! And yes, I wouldn't mind paying a certain amount for food kung busog na busog ako after. I love Pepper Lunch but haven't eaten there in a long time na. I also haven't tried the Big Ribeye Steak yet. But now that I know that's it's so good, I gotta try it soon. I love steak too! Yes! That video is a must-watch even if it's not your first time anymore, haha. Sometimes I'm at a loss on what to do kasi nakalimutan ko to check the video again. We frequent the one in SM Aura food court...pero parang bitin kami palagi sa serving. Parang konti. 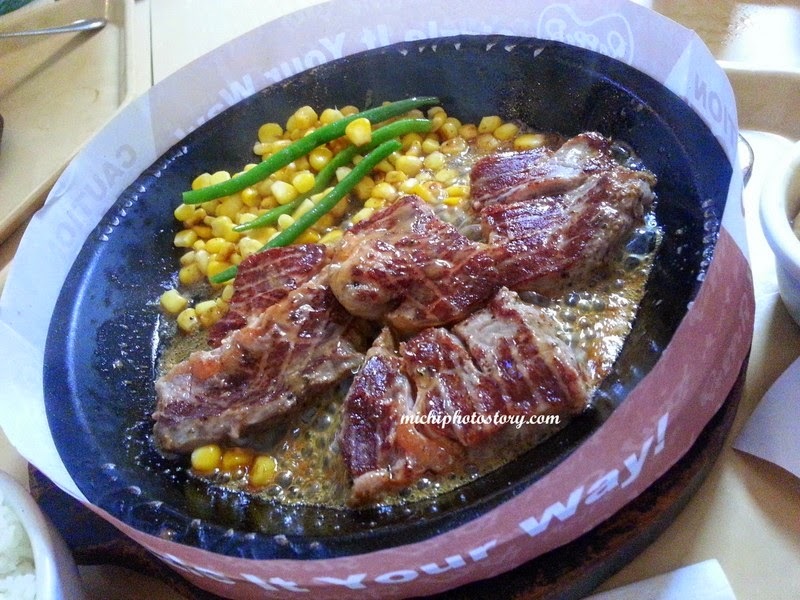 Beef Teriyaki is my favorite at Pepper Lunch. waaaaah I am so gutooom! Our first PL meal was when it opened at Shangrla... ang tagal na nun!! when the hype died down, we ignore it na, then last week, sinubukan ulit namin .. OMG!! bakit hindi namin to inaraw araw dati pa??? Will check the UN post. :) Thanks!